Technology is to thank for much of the progress we’ve made in the modern age, but as a fruitful collaboration between The Balvenie Whisky and Michel Roux Jr reveals, no machine is a match for the hands-on nature of true craftsmanship. 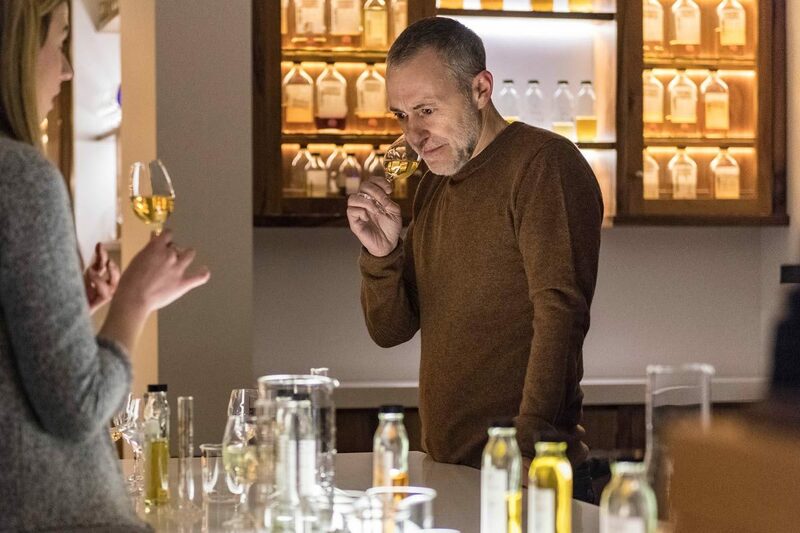 Michel Roux Jr enjoying a tasting of The Balvenie's unique range of single malts. In today’s increasingly fast-paced and frenzied society, there is a certain level of comfort in slowing things down and going back to basics. It’s all too easy to get distracted by the allure of ease and speed, the seduction of same-day delivery and drive-thru takeaways, the thrill of efficiency - but a true human touch involving the investment of time and attention to quality can never quite be matched. Having spent the majority of his life working in some of the world’s best restaurants and being surrounded by top chefs, ultimately it is Michel’s ‘old school’ approach that continues to influence his cooking. His ethos is straightforward: “Be passionate, keep it simple, and never stop learning.” This attitude extends to every aspect of his career, and helps to determine who he chooses to work with. His long-held relationship with renowned whisky brand The Balvenie was forged from his ongoing pursuit of excellence and skill, and over the past few years, he has been collaborating with the distillery to create a six-part YouTube mini-series called The Craftsmen’s Dinner. The series explores the various elements of craft involved in The Balvenie and introduces the craftspeople responsible for specific processes at each stage. It provides valuable insight into the art of whisky making and the skills and techniques required for such a task, demonstrating the pure passion of the craftspeople and their tireless dedication to their crafts. Of course, maintaining true craftsmanship is not without its challenges, particularly in our increasingly profit-prioritising era. “Cost is a big thing,” says Alwynne. “The reason most distilleries do not employ coopers on-site or have a malting floor is because it is a costly part of the business. For us, this equates to a quality product at the end that is tended carefully by amazing teams of people on a day to day basis. But this is largely achieved by the fact that we are family owned. If we were a PLC, these things would likely need to go.” For both The Balvenie Distillery and Michel, staying relevant and maintaining a competitive edge involves striking a balance between innovation and tradition. “There's a certain level of expectation when guests come to our restaurant,” says Michel of Le Gavroche. “For a lot of our guests, there's an element of nostalgia, which I love, but I also need to make sure the restaurant appeals to contemporary palates.” One can appreciate the truest qualities of craftsmanship whilst simultaneously embracing positive advancement, and this approach, says Michel, constitutes the future of craftsmanship. “I think the key is evolving whilst staying true to your roots, and paying homage to where you came from.” We’ll raise a glass to that.